Thursday 12th July 2018: Private Eye Podcast. Monday 28th May 2018: The Telegraph (Online). Saturday 26th May 2018: South Wales Evening Post. Friday 25th May 2018: BBC Wales Politics (Online). Saturday 19th May 2018: South Wales Evening Post. Friday 18th May 2018: Private Eye (Online). Thursday 17th May 2018: Not A Lot of People Know That. Thursday 17th May 2018: The Times. Tuesday 15th May: Private Eye No 1470. Saturday 11th May 2018: Not A Lot of People Know That. Friday 10th May 2018: The Times. Thursday 9th November 2017: The Helston Packet. Thursday 9th November 2017: The Helston Packet (online version). Friday 25th August – Thursday 7th September 2017: Private Eye No. 1451. Monday 7th August 2017: BBC One Spotlight SW Regional News. Friday 28th July – Thursday 10th August 207: Private Eye No. 1449. Friday 21st April – Thursday 4th May 2017: Private Eye (edition 1442). Private Eye discovers that Mark Shorrock CEO of Tidal Lagoon and owner of Dean Quarry in Cornwall failed to build Europe’s biggest windfarm, with more than 500 turbines in a Scottish designated national scenic area and a SSSI. Private Eye 1442. Friday 24th March – Thursday 6th April 2017: Private Eye (edition 1440). While CEO Mark Shorrock awaits final decision on his plan to hold back the tide at Swansea – trouble is brewing across the water in Cornwall. What was that again about “reverence for nature” at the heart of all that Shorrock does? Private Eye 1440. Saturday 14th January 2017: Not A Lot of People Know That. Wednesday 24th August 2016: The Helston Packet. 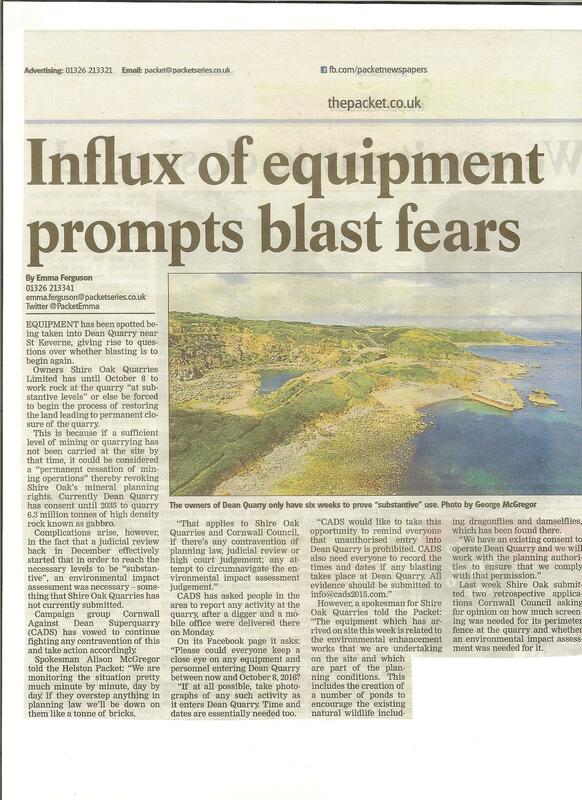 Influx of equipment prompts blasting fears at Dean Quarry. Emma Ferguson reports. Wednesday 24th August 2016: The West Briton (online version). Friday 26th February 2016: BBC Radio Cornwall Drive-Time Programme. The company behind the highly controversial planning bid to develop a Superquarry on The Lizard has withdrawn it’s application. Go to 9 mins 40 secs into the programme to hear an interview by Silke Roskilly who won the recent Judicial Review Roskilly v Cornwall Council. BBC Radio Cornwall 26.2.2016. Friday 26th February 2016: BBC One Spotlight SW Regional News. Shire Oak Quarries Limited withdraws planning application to re-open Dean Quarry and says it intends to submit a revised application. Thursday 14th January 2016: BBC Radio Cornwall Drive-Time Programme. Thursday 19th November 2015: West Briton (Helston & The Lizard Edition). Action group CADS opposing the re-opening Dean Quarry are “very hopeful” after Judicial Review. Gayle MacDonald Reports. Thursday 20th August 2015: The West Briton (Front Page). “Let Battle Begin”. Gayle McDonald reports on the High Court Judge go ahead for a Judicial Review granted to Silke Roskilly against Cornwall Council Dean Quarry re-opening plans. WEST BRITON 20.8.2015 (Clipping version). West Briton 20.8.2015 (Online version). Tuesday 18th August 2015: Western Morning News (Online Version). Monday 18th August 2015: BBC Radio Cornwall Drive Time Programme. Thursday 9th July 2015: West Briton (Helston & The Lizard Edition). Wednesday 10th June 2015: BBC Radio Cornwall. Laurence Reed talks to Silke Roskilly from Roskilly’s Organic Farm about the events unfolding on the Lizard 10.6.2015. following The Secretary of State for Communities and Local Government decision to overturn Cornwall Council planning permission at Dean Quarry. Forward to 1 hour 53 minutes into the programme to hear the interview. 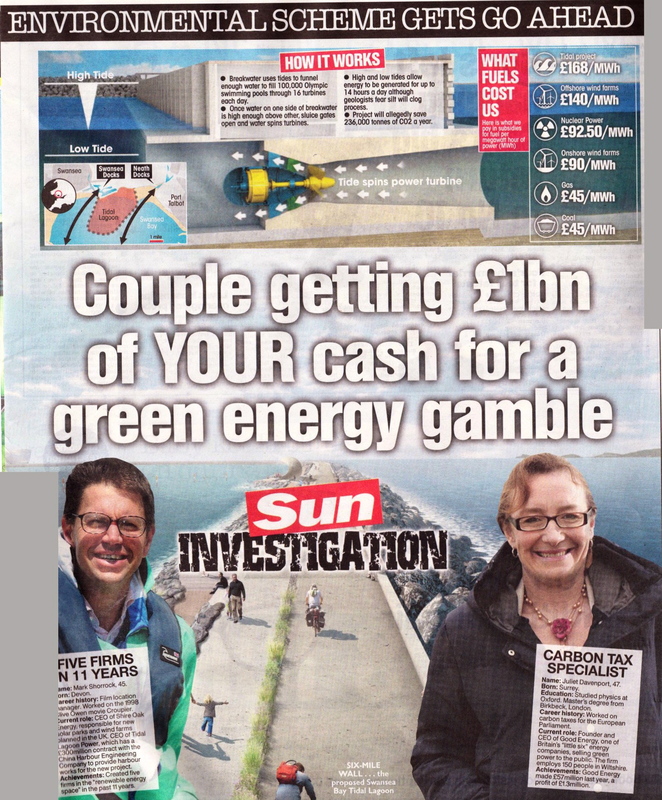 Sunday 31st May 2015: The Guardian.World’s first tidal lagoon clean energy scheme prompts environmental row. The Swansea project’s plan to reopen a quarry in Cornwall angers the locals. Terry Macalister, Energy Editor investigates. Thursday 28th May 2015. BBC News Wales. Website Version. Cornwall marine life worry over Swansea Bay lagoon quarrying. Plans to extract rock to build £1bn tidal lagoon in Swansea Bay have caused controversy – because of their potential impact on a marine conservation area in Cornwall. BBC Wales Environment Correspondent, lolo ap Dafydd investigates. Thursday 14th May 2015: Scubaverse. Jeff Goodman, Conservation Editor of Scubaverse discusses the impacts on life under the sea if development of Dean Quarry is allowed to go ahead in this Marine Conservation Zone. Scubaverse May 2015. 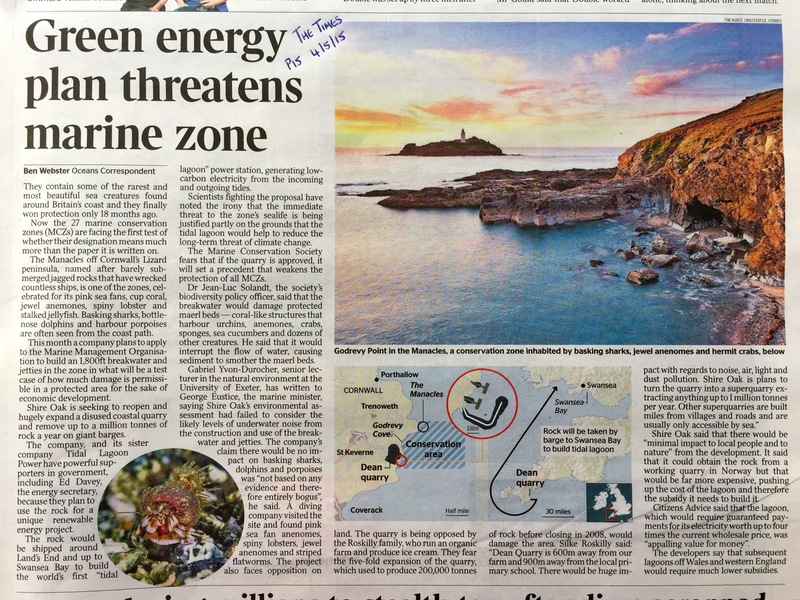 Monday 4th May 2015: THE TIMES Ben Webster, Oceans Correspondent discusses the rarity of the Manacles Marine Conservation Zone & fears of locals under threat by Shire Oak Quarries Ltd and its sister Company Tidal Lagoon Power. Green Energy Plans Threatens Marine Zone. Thursday 30th April 2015: West Briton. Article reported on the meeting of all parliamentary candidates in the run up to the election. 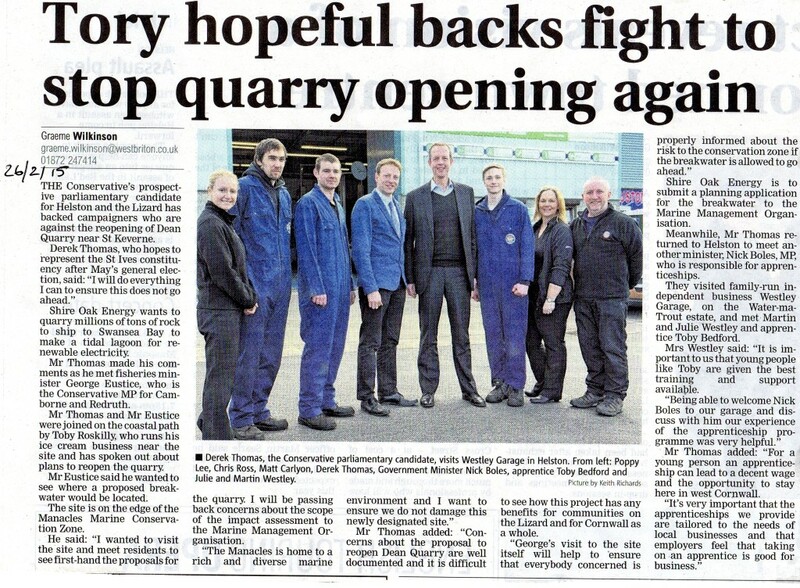 ALL candidates agreed on only one local issue – Candidates Oppose Quarry Plans. Sunday 19th April 2015 : The Sunday Telegraph article by Christopher Booker. The following article referenced Dean Quarry, in addition to concerns and searching questions raised by Giles Scott (Head of National Infrastructure Consents at the Planning Inspectorate) who is seeking a reply no later than 28 April 2015. Thursday 26th March 2015 – The Times. A letter to the editor by Paul Racey – Regius Professor of natural history (emeritus), University of Aberdeen and honorary visiting professor, University of Exeter in Cornwall. Professor Racey expresses concerns about the proposed development plans for Dean Quarry and it’s impact on the local communities & marine environment. Thursday 16 April 2015 – Daily Mail article by Christopher Booker. £1bn lagoon that could be Britain’s pottiest ever green scheme. 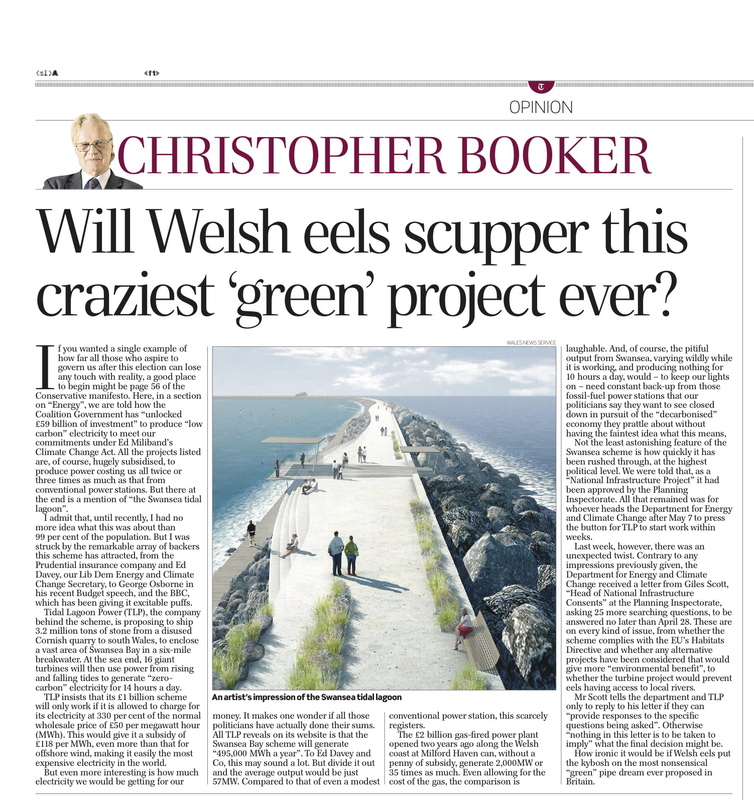 Commenting on a £1 billion scheme to build a colossal U-shaped stone breakwater, six miles long, enclosing the whole of Swansea Bay in South Wales, containing 16 giant submerged turbines, whose blades would be seven metres across and contains references to the extraction of rock from Dean Quarry. Daily Mail (Tuesday 16 April 2015). 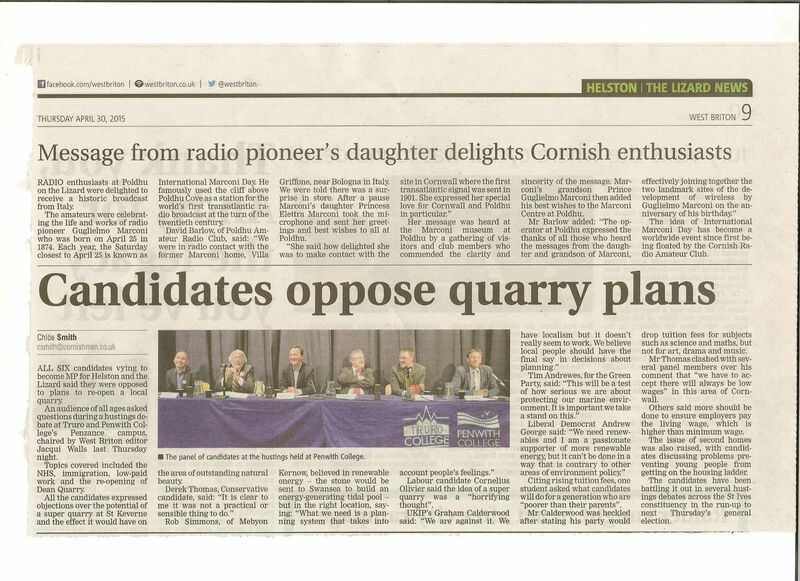 Wednesday 11 February 2015 – Letter to the Falmouth Packet – Could government’s economic plan support Dean Quarry opposition?